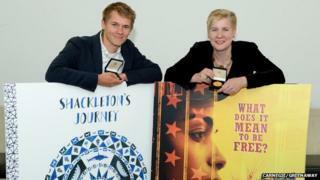 Real-life historical adventures have inspired both winners of this year's CILIP Carnegie & Kate Greenaway medals. Tanya Landman's Buffalo Soldier won the Carnegie medal and was influenced by the true story of former slave Cathy Williams, who enlisted as a man in the US army. Debut author William Grill won the Kate Greenaway Medal for his illustrated book Shackleton's Journey. At 25 he is the youngest winner of the medal since 1960. The prizes are each awarded annually to a book for young people. Agnes Guyon, chair of this year's judging panel, said: "These books push boundaries, from Charley O'Hara's often harrowing experiences in Buffalo Soldier, to the brutal landscapes and innovative colours of Shackleton's Journey. "They do not shy from difficult topics but are ultimately life-affirming in the view they offer of the human spirit's will to survive and succeed." The winners receive £500 worth of books to donate to their local library. Grill, as winner of the CILIP Kate Greenaway Medal, is also awarded the £5,000 Colin Mears Award cash prize. He beat the newly crowned Children's Laureate, Chris Riddell, to the title. Landman used her winner's speech to call for schools and libraries to be given the support they need to help children unleash their imaginations. She said: "I've watched teachers tied in straitjackets by the demands of the national curriculum and Ofsted, and students imprisoned in boxes that need to be ticked. "At a time when China is looking for ways to teach their children to create and innovate, we seem to be heading in the opposite direction. Our system is in danger of squeezing every scrap of imagination out of our children." Landman has written many books for children and young people, including the Sam Swann series, and her novel Apache was nominated for the 2008 Carnegie Medal. Grill in his speech spoke of how illustrated novels can encourage those with reading difficulties to enjoy reading as they "can also be more accessible for those who struggle with reading, as dyslexics like myself have". "I am thrilled that my book has been so positively received by schools which have seen that children learn very effectively through storytelling. "In Shackleton's case, they can see that he and his crew proved that just because you fail it doesn't make you a failure. In Shackleton's own words, 'the only true failure would be to not explore at all". In 2014 Grill won the Association of Illustration Award for New Talent and his book Shackleton's Journey was also a winner of The New York Times Best Illustrated Books. Previous Carnegie winners include CS Lewis and Arthur Ransome, while celebrated illustrators Quentin Blake and Shirley Hughes are both winners of the Greenaway. The Carnegie Medal was established in 1936 in memory of the Scottish-born philanthropist Andrew Carnegie with the Kate Greenaway Medal following 19 years later, named after the popular 19th-Century artist. The medals are judged solely by librarians across the UK and past winners include CS Lewis, Arthur Ransome, Terry Pratchett, Quentin Blake, Shirley Hughes and Raymond Briggs.